There has been a few month absence in the blog. It’s been hard to find time to write and quite frankly, the end of 2014 just really sucked dog-wise, January was all about recovery and February was about…rebirth. Despite the ice storm today, March is here and I’m starting to breathe a little bit again – happy spring is around the corner and it’s hard to hate March – it is, after all, my birthday month! So what happened? Why the long absence? And now the “rebirth?” On December 23, Emily, who I have written about before went to the rainbow bridge. She was my parent’s dog and my “sister” who had health problems the last few months at age 13. That previous weekend, my husband Jason and I, along with Tucker went up for the Christmas holiday. Jason and I had to travel to Indiana for his family’s Christmas and my parents were going to watch Tucker until we flew back on Christmas night. 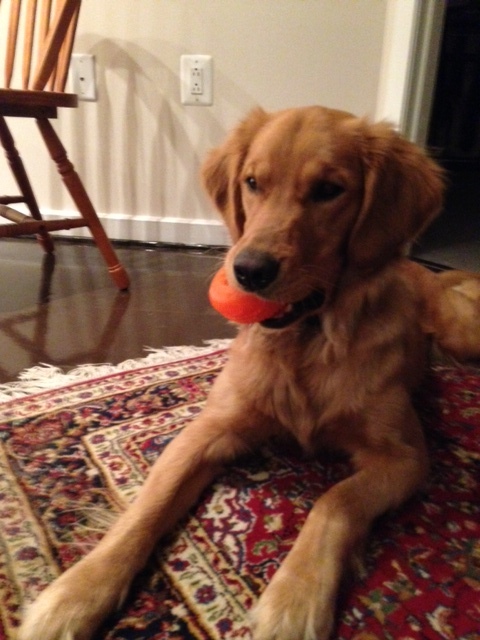 When we touched down on Christmas night, my parents met us with Tucker. Sadly, Emily had been having some episodes after we left, and they made the agonizing decision that no one ever wants to make. 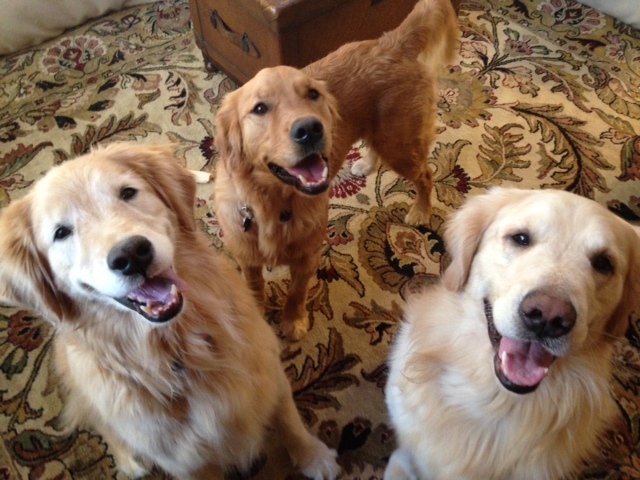 It was peaceful they said, and my parents were grateful that Tucker was there to be with them and their other golden Spenser. I was devastated but I knew that Emily had lived the best possible life. The vet told us it was likely she had a tumor or cancer and that there wasn’t much my parents could have done. We were pleased that she left us with little pain. Still, we had a good Christmas and we were happy that Tucker had done well at my parents house despite the circumstances. On December 27, we were spending our last day in PA, getting ready to head back to Northern Virginia to continue the rest of our Christmas vacation. One of my parent’s neighbor’s had gotten a puppy a few months before and we went outside to see it, leaving Tucker and Spenser inside to play. We were gone less than 5 minutes and when we came back, I noticed Tucker was playing keep away with something he had grabbed. I couldn’t see what it was, but as I moved forward, all of a sudden it was gone and I went into panic mode. I searched all around, and all I could see is that there was one less mitten on a bench. He couldn’t have swallowed that everyone said…I still called our local vet, who said to either get him to an emergency vet or if we weren’t sure, feed him bread to help him get whatever went in, out. I really couldn’t say for sure he had gotten the mitten, it was so large and even though I couldn’t find one, it could have dropped somewhere outside. So, we fed him some bread..nothing came out and he continued to act normally eat, play and potty absolutely normally. I began to think that maybe he hadn’t really gotten anything. On December 30, we went to the vet for his annual exam and shots. The vet saw him, felt him, said he had no gas or stomach pains that he could see and just to monitor him, but he certainly wasn’t acting like a dog who had gotten something. At 3 AM on December 31, I woke up to Tucker trying to throw up- he threw up dinner but nothing else. I took him outside and he pooped but everything was normal. He kept trying to throw up further and rested off and on. I was fully panicked. As soon as the vet’s office opened, I called and we got him in right away. They thought maybe it was a reaction to shots but he had never had reactions. I knew. Something was in there. They X-rayed him there and they could see the glove in the stomach. Because our vet’s office didn’t have surgery hours, we had to go to the animal hospital. We got there as quick as possible, but still had to wait hours to be seen because we weren’t a regular appointment and Tucker didn’t seem to be in distress (he had stopped vomiting). When they saw us and reviewed the X-Rays, they were hopeful they could either bring it up via making him vomit again or endoscopy. Neither worked unfortunately. They had the glove during the endoscopy but they were nervous about pulling it through the endoscope. Off to surgery, he went. I was a wreck. 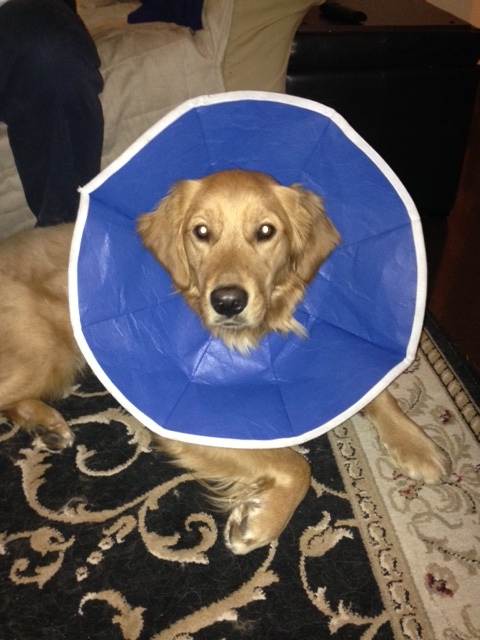 The only thing getting me through was that my brother’s golden had gone through the same thing after he ate a pacifier, so I knew what to expect. Tucker sailed through the surgery, and stayed overnight (Happy New Years Eve, right?) The next day we were able to pick him up and he’s stomach was shaved and he had a big scar in his abdomen but he was doing well. The next few weeks were all about recovery. I plan to write a full post on the surgery and recovery period separately, because I think that would really help people going through the same things, but I was so glad when after 10 days, he was able to get the staples out. The guilt though was there for me. I felt like such a horrible dog mom. How could this have happened? Nothing I read and nothing anyone said could make me feel better. The vets even said he had no symptoms and that it was likely the glove would have had to come out surgically whether we rushed him to the vet the day I thought he may have eaten something or when it actually happened. Nothing helped me calm down. We were lucky that nothing more serious happened to Tucker and I just kept thinking, I can’t lose my boy. Forgiveness of myself came in time and as Tucker healed, so did I. He certainly didn’t hold it against me and his opinion was all that mattered to me in the end. I wish I could say that Tucker has learned his lesson and hasn’t eaten things since, but sticks on walks, napkins, etc., are hard to ignore for him. We are just super vigilant on walks and also make sure nothing is where he can get it in the apartment. As I said in the beginning, February began re-birth. Tucker was feeling better and at my parents house, they were looking at getting another dog. 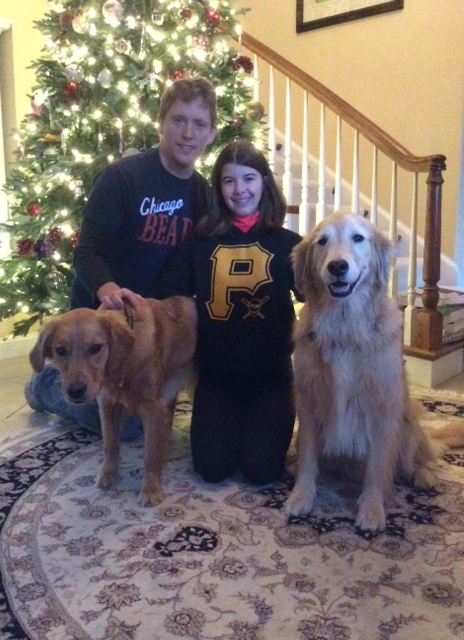 They rescued a 4-year-old golden retriever from Delaware Valley Golden Retriever Rescue named Oliver. Oliver is an amazing dog and we were so happy to meet him a few weeks back. After a few minutes of greeting, Tucker and Oliver were off running around the dining room table and wrestling like old pals. They love each other dearly. So this leads us to March. I’ve been asked to blog about dogs for a local dog magazine and I am super excited about that. I am in the process of redesigning this blog and I would appreciate any feedback you have for me. I’ve been absent for a few months but the blog is coming back with a vengeance! Stay tuned for new stuff!